Yesterday, I posted the demo of the Caroline Guitar Company Olympia Fuzz by Carter Gravatt of Carbon Leaf. I mentioned in that post he had some tasty gear. I was taking a closer look at the pedal board (because that’s what I do) and thought it would be fun to break it down. There were a few pieces that I couldn’t ID, so if you know what they are, please comment below. He’s riding a couple of pedals that I’m quite fond of myself – Tim Overdrive (wow, that thing is awesome) and the T-Rex Replica Delay. 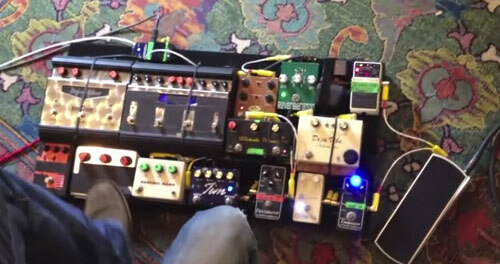 As you can see, there are 3 unknown pedals there. Love to fill in those slots. What do you think they are? The pedal after the Caroline Fuzz looks like a Demeter Fuzzulator. Those three pedals look to be: 1 a Demeter Fuzzulator, a Browntone Hoochee-Mama Overdrive, and a Guyatone Flip Trem pedal. You missed the Xotic EP booster at the beginning of the chain. I think that’s the Demeter COMP-1 Compulator Compressor. Looks like Xotic EP at first glance.